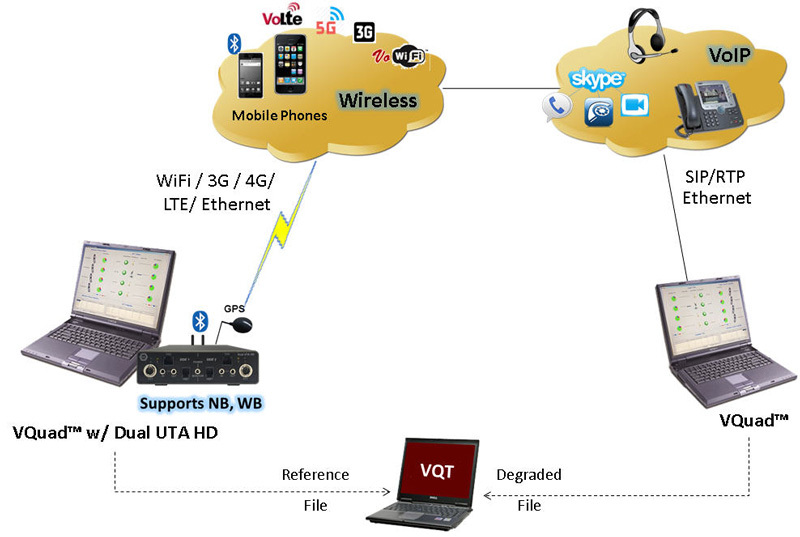 VQuad™ - Dual UTA HD, or the all-in-one VQuad™ Probe HD forms the central point of control for performing automated tests for voice, data, and video to and from Wireless devices (WiFi, Bluetooth®, 3G, 4G, LTE), Broadband Internet (3G, 4G), VoIP devices, PSTN, and TDM circuits assessing performance, quality and reliability of practically any network. Various associated applications (Voice Quality, Video Quality, Data tests, Echo and Delay tests, Fax tests, VBA) works with VQuad™ to provide "end-to-end assessment" with additional test and measuring capabilities. All the applications work in conjunction with the VQuad™ for automatically and remotely analysing the captured data and sending the test results to the central database. You can query results remotely or control the tests using web-based WebViewer™. Voice Quality Testing (VQT) software for analysis according to widely accepted ITU (International Telecommunications Union) voice comparison algorithms (POLQA, PESQ LQ/LQO/WB). GL also supports mobile device based manual and automated Voice Testing using NetTest VQT app (supported on rooted Android devices) within the network. Video Quality Testing (VAC™) application for performing fully automated Video Conference testing and get Audio and Video MOS QoS results along with several analytical metrics. Optionally, GLNetTest app on mobile devices can initiate, control, and perform the entire video conferencing testing with the support of a Video Controller/Server and Video Clients (Agents). Thus, GL provides the complete solution for Voice, Video, and Data Testing and Analysis. Listed below are the GL’s hardware / software platforms used for voice quality testing solutions across various networks. The VQuad™ provides the one box solution for sending/recording voice/video/data over a variety of network interfaces in an automated and synchronized manner. The VQuad™ requires a universal adapter hardware such as Dual UTA HD that provides multiple interfaces for connecting to any communication device on a network. Dual UTA HD (High Density) is a portable USB based hardware that supports Bluetooth® Wideband, FXO Wideband and SIP Wideband (ex: AMR WB), with which you can easily interface with any Mobile Device, FXO, or SIP devices supporting HD Voice. The VQuad™ works with any of the above hardware to perform end-to-end testing of variety of networks, including Wireless (Bluetooth®, Wi-fi, 3G, 4G, LTE, PTT), VoIP, Analog, and TDM, practically allowing any end-point interfaces to be tested for voice, data, and video quality. Various associated applications (Voice Quality, Video Quality, Data tests, Echo and Delay tests, Fax tests, Voice Band Analysis) works with VQuad™ to provide "end-to-end assessment" with additional test and measuring capabilities. The VQuad™ supports automated call control for establishing calls and verifying the call is up prior to sending/recording voice. A GPS option permits time synchronization between two geographically separated systems as well as location information for Drive Testing. Thus the test results as well as the call control information can be plotted to local street maps (almost all countries supported). The VQuad™ ITS (Indoor Tracking System) provides the means to add location information to the VQuad™ results when GPS is not available (i.e. Underground Train systems). Phone Handset for connecting to VoIP phones, Digital phones, Analog phones. Full support is also available for remote access of the VQuad™ and an SDK directly to the Dual UTA HD hardware (VQuad™ not required to be running). For more information, please visit VQuad™ webpage. A central databased stores the real-time and historic results from connected VQuad™ Probes. Various associated applications (Voice Quality, Video Quality, Data tests, Echo and Delay tests, Fax tests, VBA) works with VQuad™ Probe to provide "end-to-end assessment" with additional test and measuring capabilities. All the applications work in conjunction with the VQuad™ for automatically and remotely analysing the captured data and sending the test results to the central database. GL's WebViewer™ facilitates display of these test results, query and filter all results/events/errors from connected VQuad™ Probes using a simple web browser. All the nodes, and associated applications (Command Center, VQuad™, VQT, File Monitor, VBA, EMU, FAX, and VAC) can be accessed or controlled remotely through this web interface. The associated application status and the test results with GPS co-ordinates can be plotted on google maps. WebViewer™ also supports user-defined statistics and events configuration for both tabular and graphical outputs. GL’s vHandi™ is a compact portable hand-held FXO simulator (Foreign Exchange Office) that can simulate an analog phone. The vHandi™ call and voice tests can be completely automated or manually performed. The vHandi™ can work with GL’s Voice Quality Test application to perform centralized voice quality measurements and analysis. The VQuad™ provides the one box active QoS solution for sending/recording voice over a variety of network interfaces in an automated and synchronized manner. Using the GL VQT, analysis of the recorded voice files can automatically be executed from the VQuad™ in an intrusive manner. The VQT utilizes the ITU algorithms POLQA and PESQ LQ/LQO/WB. In addition to sending/recording voice, the VQuad™ also supports automated call control for establishing calls and verifying the call is up prior to sending/recording voice. VQuad™ now supports next-generation voice quality testing for fixed, mobile and IP-based networks using POLQA (ITU-T P.863) standard. The GL Passive Quality of Service testing allows one to monitor voice anywhere within a network (using the desired VoIP/TDM/Analog Network probe) and gather statistics and quality of service measurements. The various network probes utilize GL hardware and software applications to support T1/E1, Analog, and VoIP networks. All network probes are non-intrusive and require no active testing on either side of the call. Rather, the non-intrusive Passive Monitoring utilizes the metrics from the voice or VoIP RTP and provides statistics, analytical measurements, and in certain cases MOS results. 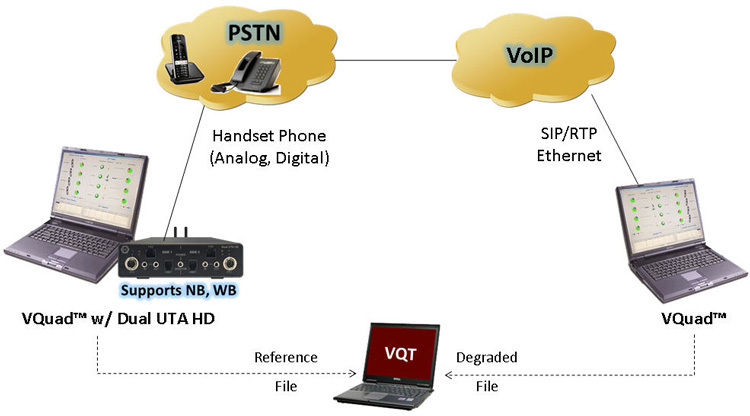 The Global Network VQT system can be achieved using multiple VQuad™ systems (nodes) at various locations, accessing the network as wireless, analog, VoIP, and TDM. A central VQuad™ Command Center will provide full control of all nodes by running user-defined scripts for all desired tests. The VQT software will provide the voice analysis of all nodes along with additional analytical metrics, round trip delay measurements, jitter, clipping, and call control statistics. Finally, the WebViewer™ is used to remotely control the entire system, display real time statistics and status of the entire system, and query the VQT results and display in both tabular and graphical formats. The WebViewer™ is a web application that can control the VQT, Command Center and individual VQuad™ applications and is capable of creating configurations/scripts, loading configurations/scripts, and starting/stopping the tests remotely. The WebViewer™ can also remotely query the VQT database and display the results both in tabular and graphical format. The WebViewer™ can access the VQT central database from a web interface for querying the results and displaying in both tabular and graphical formats. The Network Voice Quality Testing Monitoring solution from GL Communications provides a complete intrusive testing solution for any desired network including Wireless, VoIP, Analog, and TDM. This GL solution consists of 5 parts: Distributed VQuad™ Probes, VQuad™ Command Center, array of analysis applications (VQT, VBA, VAC, MDC, & EMU), central location database, and Remote Client web-browsers. Many VQuad™ nodes (termination points) are supported, each VQuad™ Node supporting up to 8 interfaces, mobile or static. The Central Location includes the database (all analytical results and call progress events), Command Center for a more flexible control/scheduling of the Network tests, and the Analysis algorithms for Voice Quality and Echo Measurements. The WebViewer™ application provides user-defined querying of the central location database over the internet or local network. 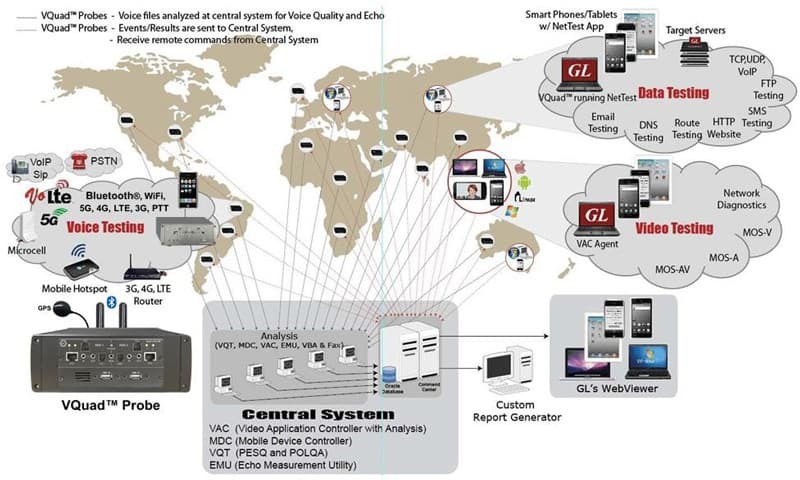 This system provides real-time voice quality measurement across a diverse set of networks. Voice calls are automatically placed between end points; quality is measured and provided for display at an NMS. Voice measurements include MOS (Mean Opinion Score), round trip delay (RTD), jitter, clipping, voice levels, etc. The essential elements of this system are Wireless / Wireline / VoIP Nodes to establish calls and send / receive voice files in real-time, and the Regional Command Center (RCC) to control the nodes. It also includes Remote Client WebViewer™ to remotely control the RCC, access, sort, and display all data collected by the RCC. The GL VQT software provides the voice quality measurement and analysis tools for all types of networks carrying voice traffic. 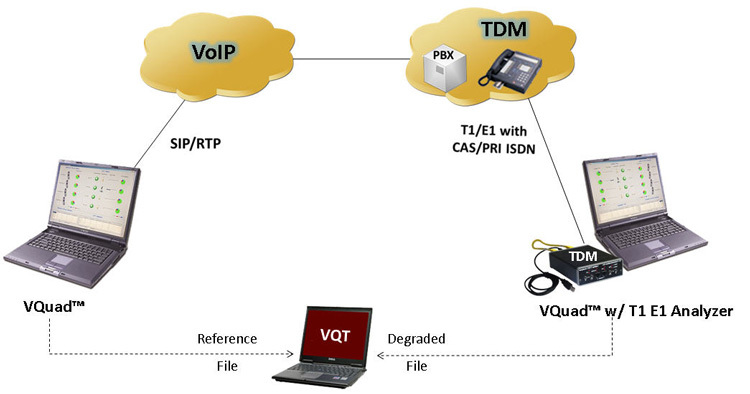 The VQT provides the analysis of the recorded voice files using ITU specifications POLQA (ITU-T P.863), PESQ (P.862.1), PESQ WB (P.862.2). 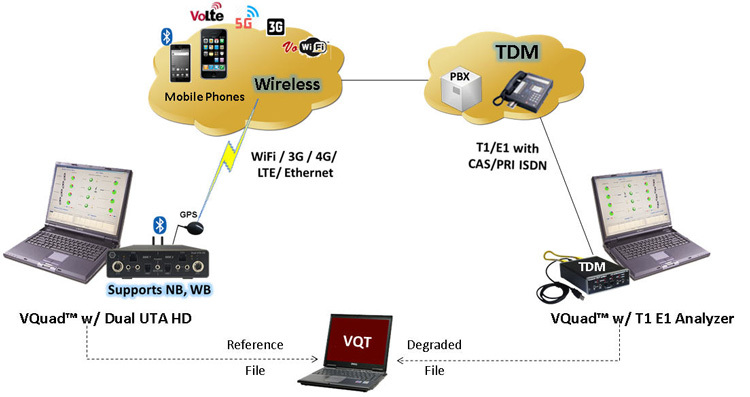 The VQT is an intrusive quality of service algorithm that can be executed in an automated fashion along with the VQuad™. Degraded voice files automatically transferred from VQuad™ nodes to VQT analysis via File Monitor Utility. For more call density, the software can be used with MAPS™ or T1/E1 Analysis products. Results are saved to a database that may be queried using the remote WebViewer™ application. GL's VQuad™ Probe (combined with VQT) supports voice quality testing solution for Wireless with various interfaces such as Bluetooth®, WiFi, 3G, 4G, & LTE. These products allow wireless network providers and equipment manufacturers to quantify impairments in a consolidated, unified, and "end-to-end" manner. Impairments to voice quality such as poor mobile phone quality, voice compression and decompression algorithms, delay, loss and gain in speech levels, noise, acoustic and landline echo, and other distortions are easily accessed and accurately measured. Automatic synchronization, automation, remote access, GPS, and time-stamping features provide added flexibility. Independent locations connected to the wireless network via mobile phones can be easily configured for sending reference voice files and recording the received degraded file, thus allowing end-to-end path analysis. Voice transmission over packet networks present challenging quality of service issues - including echo, delay, voice clipping, and other impairments due to lost or jittered packets. These problems are exacerbated even further during high loads or high degree of voice compression. Consequently, testing voice quality over VoIP has become increasingly important. Adequate tools for creating stress conditions and characterizing and measuring impairments are also essential. All VoIP Codec supported including - G.711, G.711 App II with VAD, G.729, G.726, G.726 with VAD, GSM, AMR NB and WB, EVRC, SMV, iLBC, SPEEX NB and WB, G722, and G722.1. Click here for more comprehensive information on the above codecs. GL’s VQuad™ with the optional VoIP package provides a complete voice quality testing solution for VoIP network elements. GL's voice quality testing solution for PSTN (testing analog 4-wire, 2-wire FXO interfaces) includes GL's VQuad™ with the optional FXO (2-wire analog) interface. 4-wire Analog interface connects to Balanced - headset (mic/speaker), RJ22 –phone Handset, PTT (Push to Talk), and Mobile. The VQuad™ provides for automatic call establishment and teardown, sending and recording of voice files, and automatic analysis of voice quality with VQT software. GL's voice quality testing solution for TDM network includes GL's VQuad™ with the optional T1/E1 interface. The T1/E1 interface is supported using GL’s USB based T1 E1 Analyzer unit or HD PCI T1 E1 Analyzer cards. The VQuad™ provides for automatic call establishment and teardown, sending and recording of voice files, and automatic analysis of voice quality with VQT software. 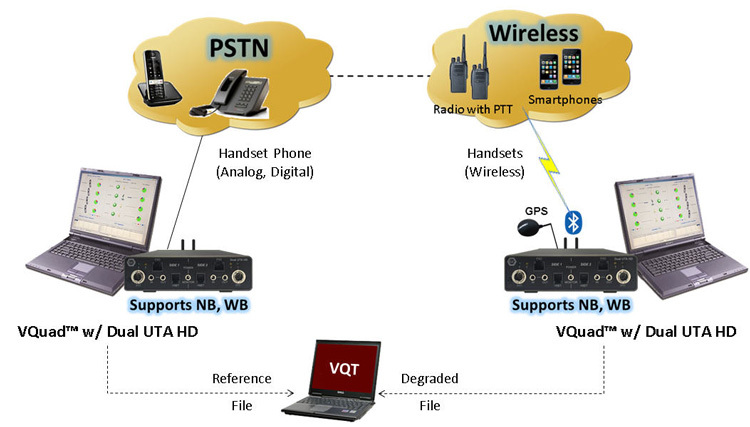 VQuad™ can generate and receive up to 12 simultaneous CAS or PRI ISDN or No Call Control (NOCC) calls on T1 or E1 trunks. GL offers numerous utilities to further aid the VQT solutions. Among these is, Text-to-Speech technology included within VQuad™ for automatically creating the necessary voice prompt for placing call over Siri or Google Voice. Also available is a stand-alone Speech Transcription Server (VQT009), an automated PC-based software that monitors for new PCM or WAV files in the directory, and transcribes short speech files into text. These applications can be used to verify announcement prompts of various voice networks and aid in Interactive Voice Response (IVR) system testing. GL’s VQuad™ solution is enhanced to support Data Testing using the NetTest application from PC and from mobile device (using MDC). Using the VQuad™ product along with a standard PC internet connection, automated tests including TCP, UDP, HTTP, VoIP, Route, FTP, DNS, SMS, Email, PhoneInfo, SimInfo, and UEInfo are supported. The PC internet connection can be wired Ethernet, WiFi, or even Broadband card (both LTE and 3G fully supported). Also available is the GL’s NetTest package for Data Testing on any supported Mobile Device. This feature uses downloadable apps for both Apple and Android devices and is remotely controlled via the GL Mobile Device Controller (MDC) system. 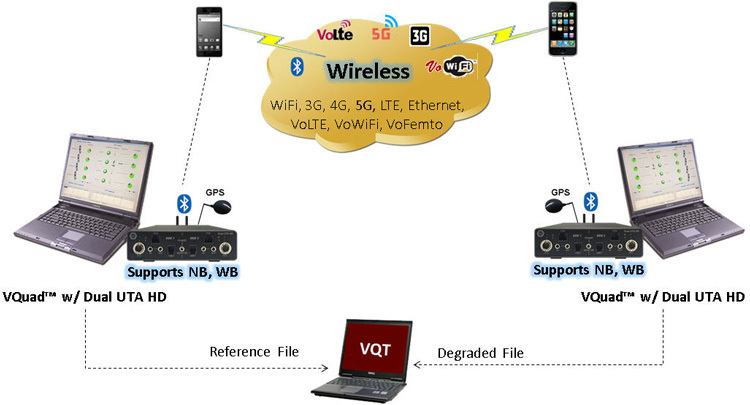 Using VQuad™ one can remotely and automatically perform these same Data Tests on Apple and Android devices when connected to LTE/3G networks or over a WiFi network. Automated Data Testing (NetTest) for Apple/Android Mobile Devices and for PC Internet connection (Broadband 3G/4G, WiFi, Wired) including TCP, UDP capacity, VoIP, Route, HTTP, FTP, DNS, SMS, Email, PhoneInfo, SimInfo, and UEInfo. Data Testing supports remotely deployed GL Data Server target points for end-to-end testing. Statistics and complete results are available through the WebViewer™ for both Mobile Device NetTests and PC based NetTests. 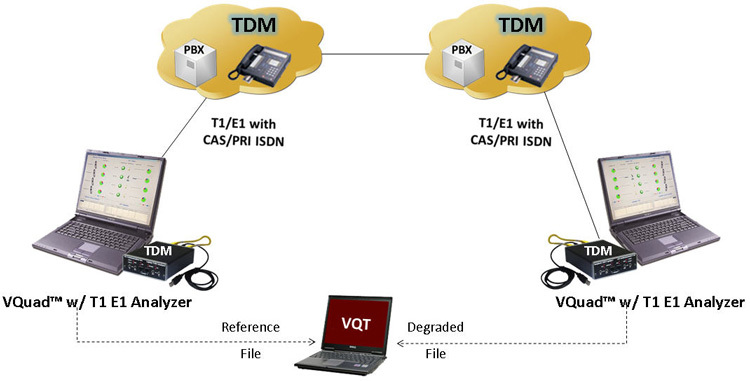 Video Quality Test Solution is used to determine the performance of a video call over a given network. It provides support for Android, PC and Linux based clients (end points) for active Video Quality Testing. Video Tests can be configured between any two active agents with flexibility on specifying the characteristics of the Video test. Tests can be run directly from the VQuad™ interface, or from the Android phones using the GLNetTest app configuring end points (Agents) and the test plan for the test. The test plans are pre-configured on the VAC server and the list of available test plans is visible in both VQuad™/MDC, as well as GLNetTest application. A test can run between android to android, android to PC and PC to PC. Both manual and automated tests are supported using the flexible and versatile VQuad™ scripts. Once the testing is complete, the results are sent to the central database, which can be viewed using WebViewer™. Ability to automate the entire test process using VQuad™ scripting; including sending the results to the central database for access via GL’s WebViewer™. GL’s Dual UTA HD features a built in Round Trip Delay (RTD) and One-Way Delay (OWD) measurement capabilities. This can be performed while both network end points are collocated or geographically separated. The Near Real-time Voice-band Analyzer (VBA) is an analysis tool for monitoring voice band network traffic. The VBA can host different analysis modules for monitoring speech and noise levels, line echo. The standard modules included in the application are ITU-T P.56 Active Voice Level analysis, and Line Echo (Hybrid) analysis. Other analysis modules such as ITU-T P.561, P.562, and P.563 can be hosted as plug-ins. The T1/E1 Analyzer is a powerful voice band, data, signaling, bit error rate tester, and protocol analyzer. It can perform analysis and emulation of various signal types including voice, digits, and tones; various protocols including HDLC, ISDN, SS7, CAS, Frame Relay, GSM, GPRS, CDMA, MLPPP, ATM, and UMTS. It is capable of T1 or E1 PCM signal visualization, capture, storage, analysis, and emulation. PacketScan™ is a real-time VoIP analyzer that captures live IP traffic, and segregates them into SIP/H323 calls and collects statistics about the calls. Applications include testing of IP phones, Gateways, IP Routers and Switches, and Proxies. Hundreds of calls can be monitored in real-time including detailed analysis of selected voice band streams. GL also offers PacketScan™ HD, a high density multi-protocol 1U rack mounted network monitoring appliance that can capture and process analysis of vast array of communication protocols covering IP and Wireless networks. GL's RTP ToolBox™ testing and simulation tool is designed not only to monitor RTP and RTCP packets, but also to allow users to manually create and terminate RTP sessions, independent of call-signaling protocols such as SIP, H323, MEGACO, or MGCP.